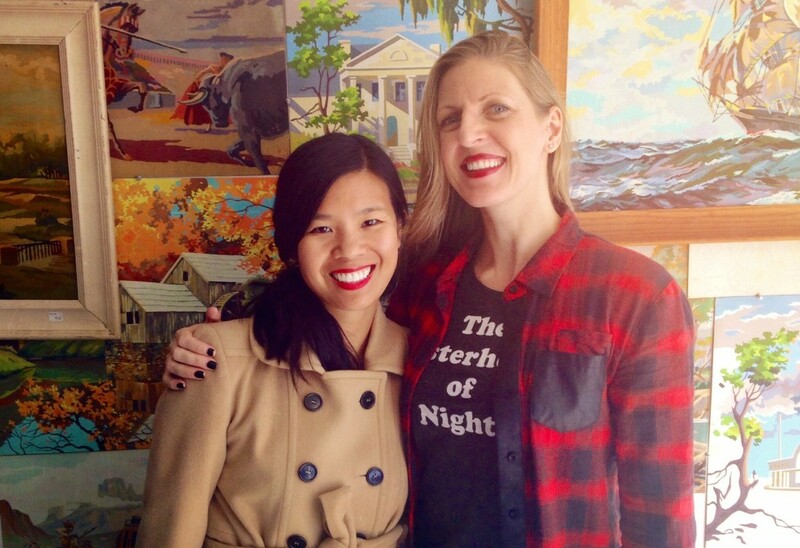 "The Sisterhood of Night" writer Marilyn Fu and director Caryn Waechter. "I’m really proud that we’re making a movie about women, and not just about women, but the importance of female friendships and how we help each other." NOTE: This post has been updated to state that Kal Penn will be in attendance on the March 13, 2015 screening of The Sisterhood of Night and that the theatrical release of the film starts April 10, 2015. Every so often, you come across a film that moves you deeply in unexpected ways. That film, for me, is The Sisterhood of Night, which I still keep thinking about weeks after watching a screener of it. The film plays at CAAMFest 2015: “The friendship between three high school girls leads to a series of increasingly dangerous events, pulling their families and community into a dark spiral of suspicion, fear and ultimately, redemption.” It’s an engaging story about the power of young women, and how oftentimes, the teenage years is such a mystery itself. Beyond our festival, the film has been picked up for theatrical release starting April 10. The film has a powerful cast including young stars such as Georgie Henley (The Chronicles of Narnia) who plays Mary Warren and Willa Cuthrell-Tuttleman who plays Catherine Huang. Kal Penn makes a great turn as the laid-back school counselor Gordy Gambhir who gets caught in the middle of a modern day witch hunt. 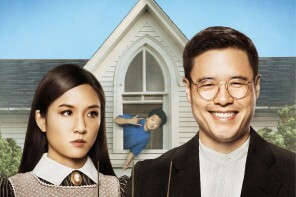 Even Hudson Yang, now famous for being the young Eddie Huang on ABC’s Fresh Off the Boat, has a role as Catherine Huang’s younger brother, his first and only film role thus far. I chatted with director Caryn Waechter and writer Marilyn Fu, who attended film school together at Columbia University School of the Arts and are both based in New York. Their friendship and collaborative spirits are palpable even through the speaker phone. The project started with Fu writing a screenplay based on a short story by Pulitzer Prize-winning novelist Steven Millhauser. Fu rummaged through her personal artifacts from her teenage years, including mixed tapes and hand-written letters, as inspiration for the film. Can you talk about how the film began? Caryn Waechter: When Marilyn gave me the script, I really loved it. There were so many characters and details. We worked together on that and then we found our first producer from Tribeca All Access. She loved our passion and enthusiasm for the project. Lydia [Dean Pilcher], a producer, has a teenage girl. She brought on Elizabeth Cuthrell, who also has teenage daughters. The four of us became this team and we made this happen. Our team includes such strong independent women. It really mimics sisterhood as a movie. Our movie has a lot of important topics to talk about. While it’s entertaining, it is a conversation starter and it deals with numerous aspects like cyberbullying, technology and diversity. How have people responded to the film so far? CW: We’ve had many, many test screenings when we were doing post-production. We were constantly testing it out with different audiences. Our core audience is teenage girls and mothers; teen boys and dads love it too. I feel really proud about that. Marilyn Fu: I’ve gotten good feedback. People respond to the fact that we have a woman of color who is a main character in the film. I’m really proud of that. I’m Taiwanese American. When you read the short story, there’s no Catherine Huang or her family in the story. I didn’t think about it too much. I just really wanted to write in that family. For that, I’m really happy that it’s there. I’m also really happy that people respond to that. This is a complex movie. CW: A lot of people really love her character and storyline. People usually connect with one of the main girls. How did you end of casting Kal Penn as the school counselor? CW: So Lydia, our producer, produced many of Mira Nair’s movies. She has worked with Kal before like on The Namesake. We needed to find a perfect guy for this role. He’s the bridge between the kids and the adults and he brings humor to the movie. Lydia was like, what about Kal? It was a really fresh idea. He was so great to work with. He’s so fun. When we were shooting, everyone called it the Kumar movie. The kids loved him. He was such a joy to work with and a really amazing actor. Also at the same time, elections were happening so he was busy dealing with that side. That was funny. We were in the middle of the woods when the election was happening. What was is like making a film about teenage girls? CW: It’s so worth it, and so worth it to do that with a friend. There are highs and lows. That’s what filmmaking is all about—collaborating. MF: I think generally, people watch movies and respond to movies that reflect their experiences, or reflect something that they remember from their experience. The thing with female-centric films and storyfelling about women is just that you have to get your story to the people who are looking at your story through the same lens. And that can be a man or a woman. One of our producers, [David Urrutia], is one of our main collaborators. It doesn’t mean that it’s gotta be a woman. I think it’s finding that lens. CW: My producers also went to men who have teenage daughters for financing the film. It really is geared toward teenage girls. If you’re a parent, or woman in your 20s and 30s, it will speak to you. Because we all have to deal with the internet and how we communicate. But it’s hard to make a movie about women. I feel like it’s changing. I’m really proud that we’re making a movie about women, and not just about women, but the importance of female friendships and how we help each other. Expected Guests in Attendance: Marilyn Fu (Writer) and Caryn Waechter (Director) for all screenings; Kal Penn (Cast) for March 13 screening; Willa Cuthrell-Tuttleman (Cast), Evan Kuzma (Cast) and Elizabeth Cuthrell (Producer) for March 16 screening. Read more: “Women Making Films” at CAAMFest 2015. Hudson Yang, Jessica Sanchez, Danny Pudi, Sonal Shah, & Parvesh Cheena want you to vote! Looking forward to this! And BTW, Kal Penn is in 2 movies this year – also in Bhopal, A Prayer For Rain. For all those SuperKalFans out there!